So what’s the big deal about Google+ Hangouts? Isn’t it just another video-chat product? Dozens of them are on the market — Skype, Facebook, Microsoft Live Messenger — even Xbox has its own video chat, but Google+ provides some additional marketing benefits when compared to the others. 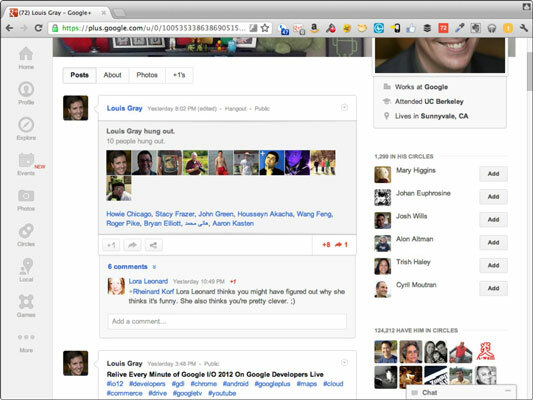 Every Google+ Hangout is embedded right in the feed. Every Google+ Hangout started shows up in the Google+ news feed — right along with every other update on Google+. So when your friends (and the other people you’re interested in) start their own Hangouts, you have the opportunity to join and get to know them better. Hangouts offer an easy way to discover opportunities to meet people face to face. Hangouts can target specific circles and people to chat. Each Hangout you start gives you the opportunity to choose who can participate in the Hangout. You can invite the entire public or just specific people. Leo Laporte, host of TWIT.tv, uses circles in Hangouts to invite influential media and web personalities to participate in his podcasts. He then records and broadcasts these conversations for the world to see. Hangouts are all about collaboration. Each and every Google+ Hangout is built around a large onscreen canvas, with pictures of the individual participants below. The canvas usually fills up with the person currently talking, but you can also use apps, watch videos, or even share your desktop to get others collaborating with you. All those participating work together face to face, no matter where they are in the world. Hangouts help you build relationships. As you collaborate with the other chat participants, you’re also building relationships. As you use Google+ more — and start to participate in Hangouts — you’ll find that Google+ has its own unique, tight-knit community. One reason for this closeness is that many of those who participate have seen each other face to face — and have built relationships through participation in Hangouts. Many people have built their followings by getting to know other people individually through Google+. Everyone has a story — and Google+ Hangouts are a golden opportunity to find out the story of each person you interact with and meet new people in the process. 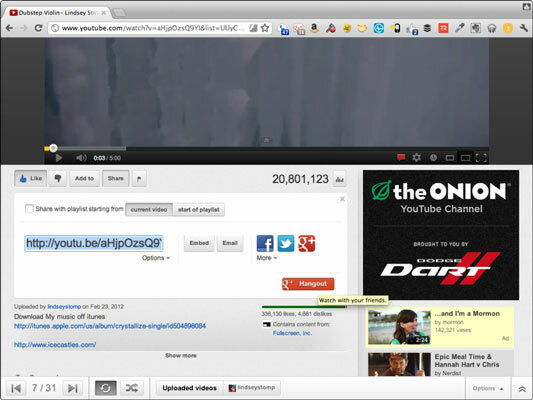 Google+ Hangouts have deep integration with YouTube. You can use Google+ Hangouts to watch videos with your friends. Built into each Hangout is the capability to watch any YouTube video — just click the YouTube button at the top of the Hangout, and click Allow to allow the YouTube Gadget. Then select the video and click Play, and everyone will be watching it with you. In addition, when you choose to broadcast your Hangouts to the world, they stream live (or recorded) over YouTube as people visit them to watch. So you get to make contact with a wider community of hundreds of millions of people on YouTube as well, bringing even more eyes to your Hangout — and to your brand — in the process.